This must be the time of year when new models build and price tools go up. The new Regal’s is. Let’s start off with the standard Regal liftback and its price break down. Awd is an option, but not on the base trim( more on that later). In a move that makes me think this is industry wide (look to the Stinger for this same thing), there are only 2 exterior color choices: white and a $395 silver metallic. There is only one interior color choice, shale, which is a weird wheat gray like color. I choose silver for $395 for the sake of this build. There are no options which, along with the limited color choices, makes me think this trim will see more rental duty than actual buyers. The only options are an engine block heater for all your northerners for $100 and a front license plate bracket for $40. I choose none of these. In typical GM fashion there are a lot of dealer installed accessories. I counted 37 in all ranging from Bluetooth headphones to battery jump starters to exterior care kits. And of course OnStar option plans. Choosing none of these for this basic trim: $26,310. Not bad but way too basic for my money. Next trim is Preferred. There are 2 Preferred trims: Preferred and Preferred II. On these trims, you can get Awd but only on Preferred II. The Preferred starts $28,590, $30,655 for Preferred II. Exterior color choices are better on this trim. There are 2 standard colors: white and an almost British racing green but a little darker color. There are 6 premium color choices. All are $395. 2 interior color choices: black cloth and shale cloth, round out the interior. I choose black metallic for $395 with black cloth. There are 3 option packages: a Driver Confidence package that’s pretty much safety aids for $1245, a Sights & Sounds package for $1720 that includes things like remote start, navigation with 8’ touch screen and Bose audio, and an interior protection package that’s $200 for a cargo tray and all season mats. I choose the Driver Confidence and Sights & Sounds. Drive Confidence also adds LED headlights with auto leveling. A power moon roof is a grand. Other exterior options that are AARP fare are splash guards for $170, a wheel lock kit for $60 and the same engine block heater and license plate frame. I added sport pedals for $175 and illuminated door sill plates for $395. With none of the tons of accessories the Preferred is $33,520, Preferred II with the same options is $34,645, $36,595 with awd. Next up is the Essence trim. It’s the top line before the GS. It adds luxury standard features like heated leather seats. It starts at $35,650.It has the same exterior and interior color choices as the Preferred trims, but interior seat options are leather instead of cloth. Option package wise it’s the same as well but it adds an additional package: a Driver Confidence II pack that adaptive cruise and follow, forward collision alert with auto braking and pedestrian braking and lane departure warning with keep assist. At $1090 adding it requires you add Driver Confidence I package. Adding the same moon roof, door sills and sport pedal options, you’re at $38,235, $40,285 with awd. Now comes the one we all want, the all new GS. All new for ‘18, it gets awd and GM’s 3.6 V6 with 310 horses standard. It starts at $39,990. Exterior color choices are limited but sporty. There are 5 total: 1 unique to the GS and 4 premium. The Sport Red Color shown above, is unique to the GS. I selected this. Only one interior color choice is available: black sport seats embroidered with red GS logos. Option package wise, the GS only gets the Driver Confidence II package for $1690. I added this and the Sights and Sounds pack for $945. The GS also gets an Appearance Package that adds a wireless charger and LED headlights with cornering lamps and led headlights with auto level.It’s $485.With the same options selected of the moon roof, sport pedals and door sill plates, the GS comes in at just under 45 grand:$44,680. Kinda pricey. 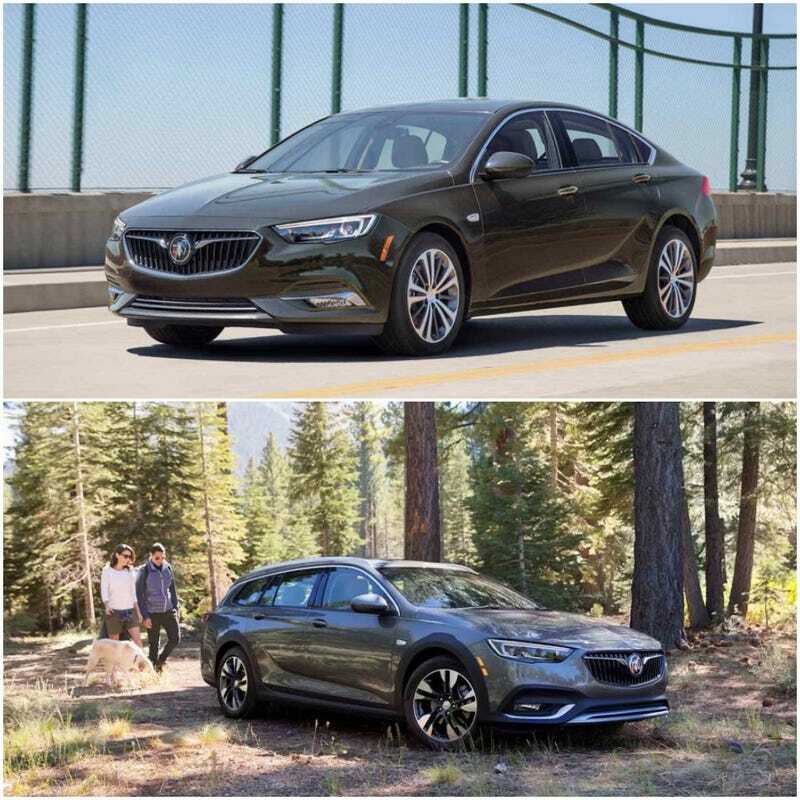 The other new Regal model we’ve all been excited about is the new TourX, which is pretty much a Regal wagon, though Buick doesn’t want you to think of it as a wagon as evidenced by the X in its name, and its Subaru like ride height and body cladding. The awd system also features an active twin clutch.There are only 3 trims (sadly no GS trim) for the TourX: bargain basement 1SV, Preferred and Essence. The base TourX starts at $29,995 for the 1SV. All trims come standard with the 2.0 turbo 4 and awd. Like the regular Regal, the 1SV trim has limited colors: the same 3 exterior and one interior. I choose the Black Metallic for $395. There really aren’t any options for this Hertz trim. Like none. With no options a base 1SV TourX is $30,390. Next up, the Preferred, starts at $33,575. Of course, there are more color options: 8 total for exterior. 2 regular and 6 premium and 2 colors for interior cloth: black and shale. Weirdly, you can get the same red exterior color that the GS comes in. I choose black metallic for $395 with black cloth. Option packages mirror those on the Regal, so I choose the Driver Confidence one package for $1,240 and Sights and Sounds for $1,870. The moonroof option on the TourX is different as well, its a full panoramic and its $1200 bucks. Choosing the same sport pedals and door sills a Preferred trim with the other options is $37,650. Lastly is the top trim Essence starts at $37,040. Choosing the same Driver Confidence I and II packages and Sights & Sounds, the pano roof, sill plates and sport pedals, a loaded Essence comes in at $42,120. Not as pricey as I would have expected. All it all it should be a solid and different entry into the segment by offering not only the convenience of a liftback and wagon variants, but the versatility of awd on both versions and a sporty alternative in the GS.